The collect and readings for today, Ash Wednesday, may be found here. We know it happens but on the whole our culture tends to deny and ignore the reality of death. Look at how sterile and easy the funeral industry tries to make our dealing with death. Fake grass hides the dirt that will fill the grave and make up is used to suggest sleep not death. Though I have nothing against good health or good looks I wonder sometimes if parts of medical science and the cosmetics industry have become just another way of avoiding the reality of death. Even our day to day lives, the busyness, the consumerism, the various addictions, the rugged individualism that needs no one and no help, are often ways we ignore death and reinforce the illusion that our life is our own. None of this is to suggest that we have not been profoundly affected by death. We have. We have cried, suffered, and grieved. Still, the conversation is difficult and the reality avoided whenever possible. To deny death, however, is to deny our need for God. That denial keeps us from living and gives death the final word and the ultimate victory, the very thing we are trying so hard to deny and ignore. To acknowledge the reality of death is to acknowledge our need for God, the one who is and gives life. The first step in beginning to live is to stop denying death. That’s exactly what the church does today. Today, the Church stands in opposition to our death denying culture and behaviors. It responds to our fears about death. It does so in an unexpected way. It marks us for death and reminds us that we are dust and to dust we shall return. A smudge of cremated palm leaves declares our mortality, a visible reminder of the many deaths we have suffered; physical, emotional, and spiritual. Ash Wednesday declares that you and I have been marked for death. The truth is we have been returning to the dust starting the day God formed us from the dust of the ground and breathed life into our nostrils. The reality is we will die. Death, however, is not God’s punishment on humanity. We are not sentenced to death. Death is simply a fact of being a creature. We have a beginning and we have an end. Remember that you are dust and to dust you shall return. This remembering of death, our “dustness,” begs us to consider how we are living now. If we are honest, we will weep for what we could have been and are not, we will mourn for what we have done and left undone, we will name the destructive ways in which we live and relate to God, one another, and our self. In the weeping, mourning, and naming the ashes of death become ashes of life and healing, pointing us back to God. 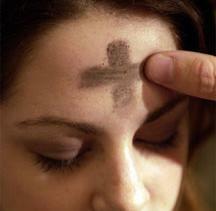 You see Ash Wednesday has never finally been about endings or failings. It is about moving out of error into truth, out of sin into righteousness, and out of death into life. Throughout Lent we are invited to become, do, and change in ways that open us to receive the life God offers. That is the invitation to the observance of a holy Lent. We align our lives, desires, choices, and actions with those of God. And, maybe for the first time, we know death for what it is, the gateway to life. “…death…, the gateway to life.” This reminds me of a sign above the north doorway (transept) of a cathederal in Italy which read “del porto est paradiesium”. This is all miss-spelled Latin or Italian, but it means “The door or gateway to Paradise”. In the middle ages churches were designed to symbolize the life cycle—People were baptized in the baptistry just outside the front door, lived their life in the nave, and upon their death passed through the gateway to the cemetary on the north side of the church. Simplistic, but full of meaning, resonating with life beyond death, and that death is merely a period (.) to mortality. I really like the symbolism and meaning in the church’s architecture. Your comment is very timely. I have been thinking a lot lately about that symbolism. The spiritual journey is sometimes described as purgation, illumination, and union. I have been thinking about how those three stages correspond to the narthex, nave, and sanctuary of the church. Thanks Mike – I really liked the sermon – very appropriate for our family about this time. See you soon.